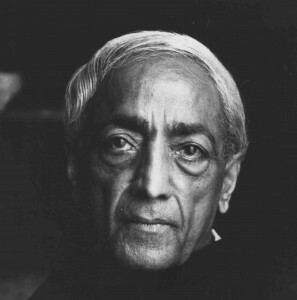 Jiddu Krishnamurti was a public speaker, mystic, author, philosopher and writer on philosophical and spiritual subjects. In his early life he was groomed to be the new World Teacher but later rejected this mantle and withdrew from the organisation behind it. Mother met J.K. in Delhi. He was staying at Kitty’s house and the meeting took place in her garden. Mother told us all about it (in Bengali). She related how She told J.K.: “Pitaji, why do you speak against Gurus? When you say one does not need any Guru, sadhana etc., you automatically become the Guru of those who accept your view, particularly as large numbers of people come to hear you speak and are influenced by you.” He: “No, if you discuss your problems with a friend he does not thereby become your Guru etc. If a dog barks in the dark and alerts you to a snake, the dog does not thereby become your Guru!” At the end he took Her hand in both his and said: “I hope to meet you again soon”. In her authoritative biography of J. Krishnamurti, Pupul Jayakar describes the meeting between Krishnamurti and Anandamayee which took place in the Delhi home of Kitty Shiva Rao. “They met in the garden, as the mother never entered the home of a householder. She did not speak English, and spoke through a translator (Krishnamurti no longer spoke any Indian language). She had a radiant smiling presence. She said that she had seen a photograph of Krishnamurti many years before and knew that he was very great”. Pupul Jayakar continues: “Many visitors came and prostrated themselves at the feet of J.K. and Anandamayee Ma. Anandamayee Ma accepted their greetings, but Krishnaji was embarrassed. As always he would not permit them to bow down but sprang to his feet and bent down to touch the feet of the seeker of blessing. Later after Anandamayee left, Krishnaji spoke of her with warmth and affection. There had been communication, though much of it had been wordless.” Anandamayee Ma was always extremely respectful and deferential in the presence mahatmas, often referring to herself as a simple, uneducated child. But this did not in anyway however inhibit her from asking them direct and penetrating questions, particularly if she did not agree with them on a particular point. In this description of their meeting, and particularly in the portrayal of their different responses to dealing with the public, is revealed an essential difference between Anandamayee Ma and J. Krishnamurti. Anandamayee Ma made no distinction whatsoever between herself and those bowing before her. She saw everything as “God interacting with God” as she would sometimes say. In any case, to bow before a respected and revered figure in India is as common a gesture of elementary respect as shaking hands in the West. Anandamayee Ma had no desire to do away with tradition but on the contrary wanted to revitalize it, bringing out the fundamental spirituality upon which it was originally based. She often pointed out that in the act of bowing down (making pranam), particularly to an exalted spiritual personage, a profound transmission of spiritual energy takes place —something utterly beyond the mind that is the antithesis of anything debasing or humbling. But whereas she is in a state of absolute non-duality, aware only of the all-pervading Divinity in herself and others, Krishnamurti is self-conscious here, ‘embarrassed ‘, admitting to a sense of separation, no matter how genuinely humble and humanistically expressed, between himself and others. Taken from “Death Must Die”, the diaries of Atmananda, edited and commented upon by Ram Alexander. From Shree Shree Ma Anandamayee Prasang, by Amulya Kumar Dutta Gupta. be a guru”. He did not say anything in reply to this. not ready to accept him as their guru.